• OLB/WR Derek Burns, 6-3, 185, So. • TE/OLB Ramsey Baty, 6-3, 195 Jr.
Next workhorse in the backfield? Losing Anthony Rey following his graduation is no small challenge for the Mavericks to overcome. Rey found the endzone 27 times on the ground last season, to go with 1,763 yards. There is a void in the backfield and the options don’t appear clear for the Mavericks right now, as Willie Davis who was expected to rise up to the role transferred to Miami Central prior to spring football. Overall, that might force a reliance on the passing game until someone emerges to the fill the big shoes that Rey has left behind. Who is setting up behind center? Mavericks’ head coach Byron Walker is comfortable in quarterback Quinn Dempsey’s ability to take over the starting job, and with good reason. The junior certainly performed in limited playing time last season, appearing in eight games and completing 10 passes for 180 yards. Dempsey also showed his prowess on the ground, accumulating 50 yards on just five carries, one of those carries going for a touchdown. Dempsey will have to follow up to fill some big shoes and will have to likely to do a lot of the heaving lifting until something becomes clearer in the backfield. Back to back? After going a perfect 11-0 and winning the Gold Coast Conference, Archbishop McCarthy will certainly be the team to beat. There are four new teams joining the Gold Coast Conference, all of which posted winning seasons last year. 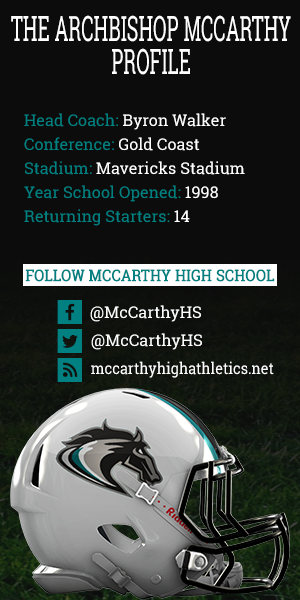 With new talent to match up against while attempting to adjust to a new starting quarterback and running back, it will be difficult for the Mavericks to replicate their success from this past season. Difficult, but not impossible. 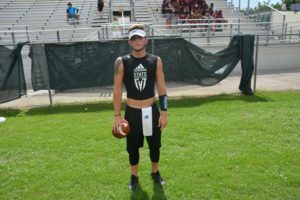 • Sept. 30 Coral Springs Charter – This game will be an interesting one as Coral Springs Charter won the the Southeastern Football Conference title last season before making the move into the Gold Coast Conference for this season. Charter might be down a bit in terms of depth and team numbers, but if Coral Springs Charter comes out of the gate strong, this could be a really good game for the Mavericks. 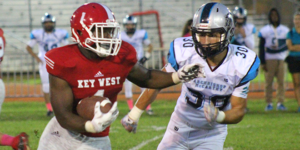 • Oct. 28 Key West – The Conchs have been a big foe for the Mavericks the last two seasons and we don’t expect that to totally change – even if the Conchs don’t have Mekhi Sargent in the backfield anymore. 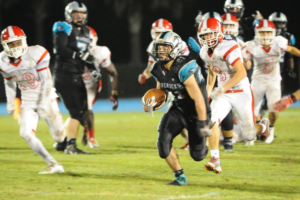 There is a lot of pressure on Archbishop McCarthy to perform up to last year’s standard. Performing at that level is nothing new for head coach Byron Walker who’s experience as a head coach has accumulated 286 wins to just 141 losses (good for a .670 winning percentage) at three different schools, most recently bringing his winning tradition to Southwest Ranches to coach the Mavericks. The team must deal with losing two major offensive weapons, but if there is one thing the Mavericks should be confident in, it is their ability to play defense. Returning eight starters on defense, the Mavericks should be able to maintain the defensive pressure they brought every night last season. The defense gave up 20 points just three times (two such games came against conference rival Key West) and held opponents under 10 points six times, including a shutout on the road against Coral Glades. Reigning conference Co-Defensive Players of the Year Logan Giordano and Andrew Hallman ran the secondary like a well-oiled machine and do not plan on allowing any aerial success by their opponents this year either. A proven and experienced unit on the defensive side of the ball will help Quinn Dempsey have some time to adjust to his new role at the forefront of a prolific Mavericks offense. Kyle is a student intern for FloridaHSFootball.com and also covers high school sports for the High School Programming Network. He attends Coral Glades High School in Coral Springs.